In the past year, I have fully embraced baking my own challah. There is absolutely no comparison to warm, homemade challah, fresh from the oven so we haven’t had store-bought challah in our house for quite a while. My current favorite recipe (the Beigel Family Challah from Joan Nathan’s The Foods of Israel Today) goes through three rises and it’s not a short endeavor. So, I was really excited and curious when my sister-in-law (of the awesome site Mock-Off) said she’d read about a company that had developed challah mixes. But could challah from a mix really be as good as from-scratch? I contacted them to see if they’d be willing to send me some mixes to try out and share with you. Tribes-A-Dozen‘s clever motto is “Break bread, not tradition.” The whole idea is that by using the Voila! 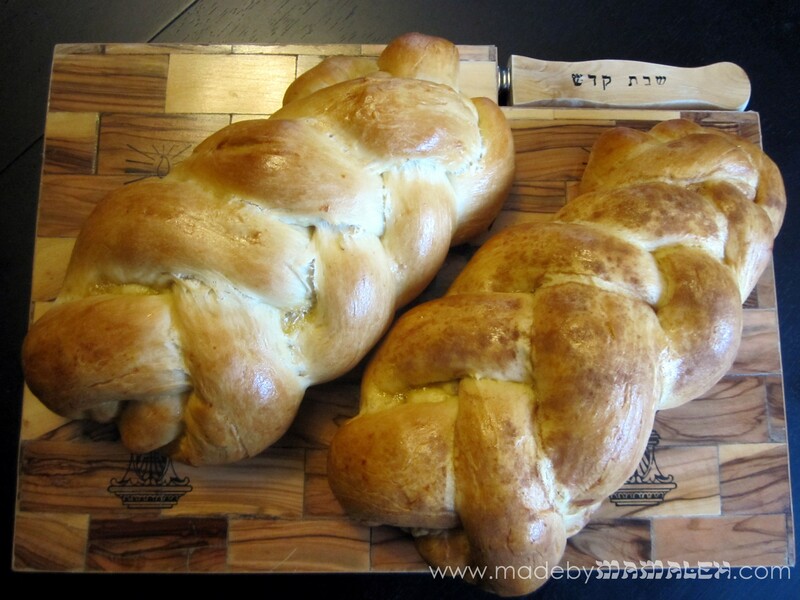 Hallah mixes, you can make a traditional challah in under two hours. I love the idea of making it more accessible to the modern family! They offer three varieties: Traditional, Wholey Wheat and Spelt, all available on Amazon and some East Coast supermarkets. Definitely an “A” for packaging; I think the cute boxes would be great for gift baskets. Inside, the boxes include a yeast packet and mix while the back of the box has detailed instructions. I decided to start with the Traditional. For this one, you need eggs, oil, and, water. Sesame or poppy seeds (for the top) and sugar (for the egg wash) are optional. 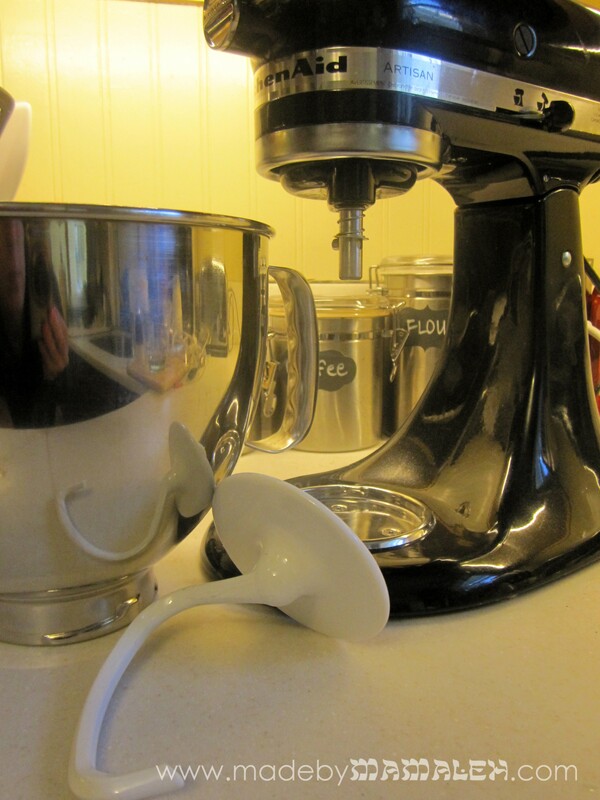 The preferred method for mixing is with a stand mixer although it does say it can be done with a bread machine or by hand. My Kitchen-Aid is my challah making friend for sure! 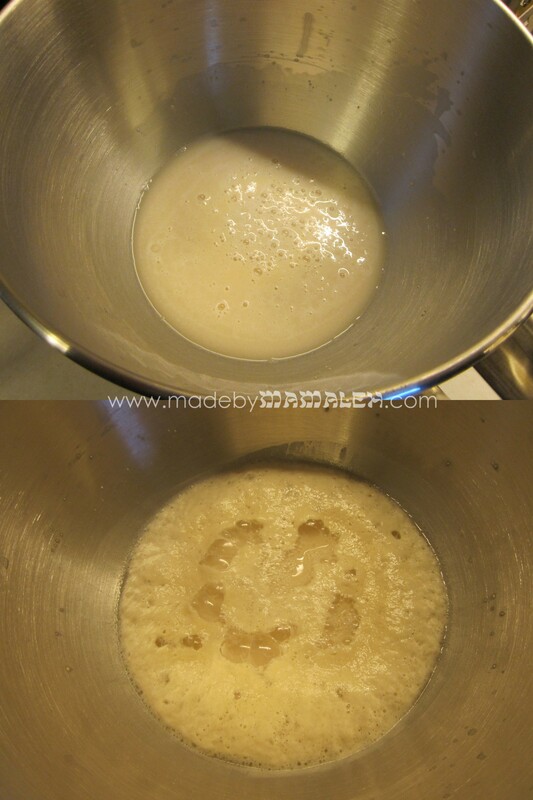 After following the mixing directions, the dough appeared as in photo 2 below. It was definitely much stickier than my go-to challah recipe. The first rise is only 10 minutes and it did not rise all that much. 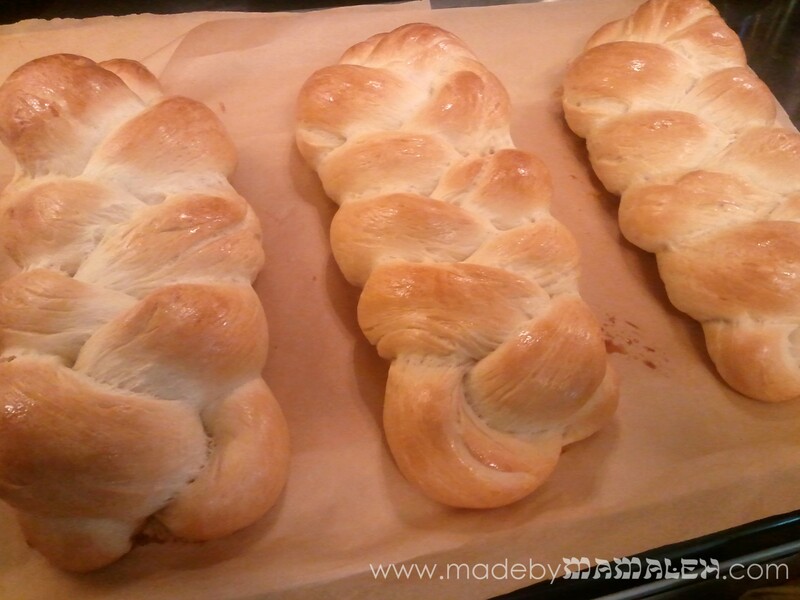 After the 10 minute rise, I braided the challah and applied the egg wash (which I did add a little sugar to). It was definitely much stickier dough than I am used to working with but I didn’t have any trouble rolling it out on my silicone mat. After 45 minutes of rising on the parchment-lined baking sheet (again little visible size increase), it then baked for about 25 minutes and came out this lovely golden color (picture 4 sitting atop my awesome bread warmer stone). I do have to say that he beautiful color is thanks in part to the yummy farm fresh eggs from my friend Andie’s Farm. Now that we’ve switched to farm fresh eggs, we won’t go back. The difference is amazing. Andie’s even done a comparison on her blog if you need further evidence of the merits of farm fresh. As the Traditional was rising/baking, I set to work on the Wholey Wheat and Spelt. Both call for the same additional ingredients as the Traditional along with some honey. The directions vary from the Traditional and call for longer rise times, so be sure to follow them carefully. Even after the longer rise, both were quite sticky but again manageable on the silicone mat with some flour for forming the loaves. Now I’m not sure if I didn’t braid them tightly enough or what but as you can see in the photos below, the braids lost their definition after baking. I looked through the tips on Tribes-A-Dozen’s page and couldn’t find anything that might explain this. They were all good but definitely not as good as scratch. I told my husband and our friends doing the taste testing (on Christmas of course!) that the comparison should be whether they are better than store-bought. The consensus was they are better than your average grocery store challah but probably not better than a decent bakery. The texture on the Traditional just wasn’t quite what I’d hoped for and look for in a challah. Although you do get the added benefit of getting them warm from the oven which is a big plus. The stand-out was the Wholey Wheat, which despite it’s undefined braids, had a really yummy wheat flavor and great texture – much better than the whole wheat challahs I’ve made before. So, if you are not a challah purist, I think the wheat is definitely worth a try. As for the others, I’m on the fence. I think that if you are new to baking bread and/or challah, they are a good way to ease in on a smaller scale. They also do simplify the process and shorten it time-wise which is a selling point too. Like I mentioned before, I also think they’d be sweet in a housewarming gift basket along with some dish towels and measuring cups or other kitchen essentials. What do you think? 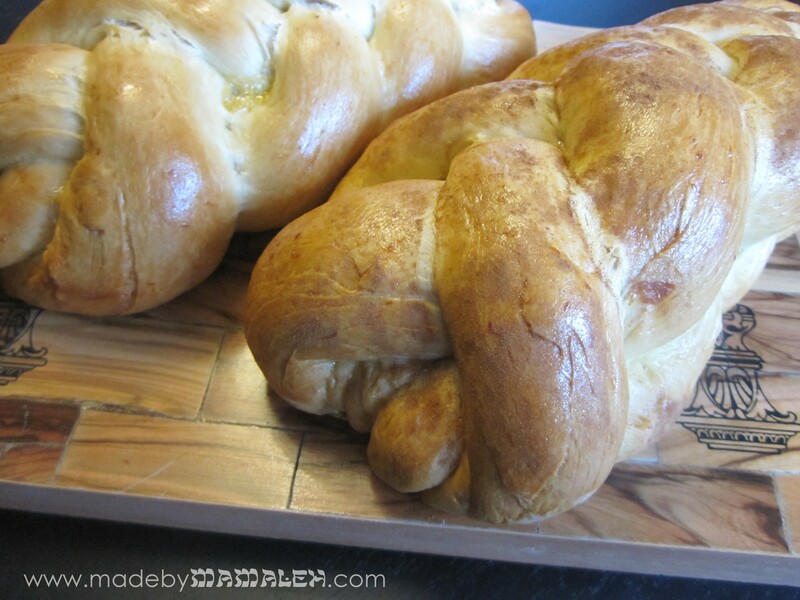 Would you try challah from a mix? P.S. 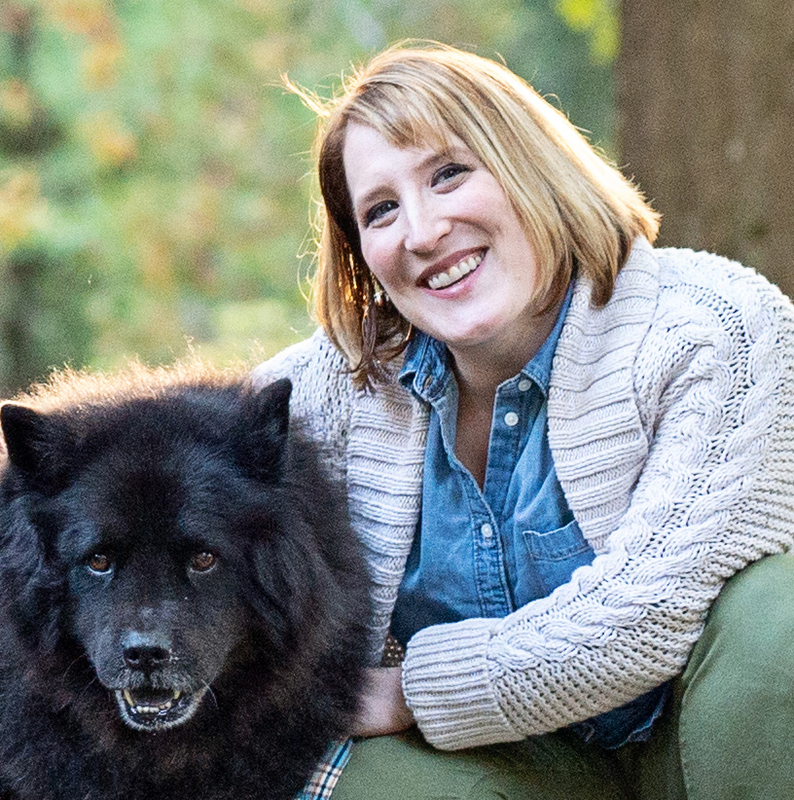 In case you missed the post on Facebook, Heidi was the winner of the Michael’s gift card. Remember to follow Mamaleh on FB for more fun posts and tips in between blog updates. Just be sure to click show in News Feed under the like button so that you don’t miss any posts. Note: I was not financially compensated for this post. I received Tribes-A-Dozen mixes free for review purposes. The opinions are completely my own based on my experience. Until this year, I’d never made challah before. Of course I love to eat it but the thought of making it totally intimidated me (probably because I remember one attempt by my mom when I was a kid did not resemble challah at all, sorry, mom). In an attempt to cook more and put my cookbook library to good use, I challenged myself at the beginning of the year to try one new recipe a week. For the most part I’ve kept up with the challenge, some weeks cooking less and some more. But, what I’ve found is that trying different challah recipes has played a big role in the challenge and I’ve figured out that making challah really isn’t so scary and actually the process is rather therapeutic after a hectic week. 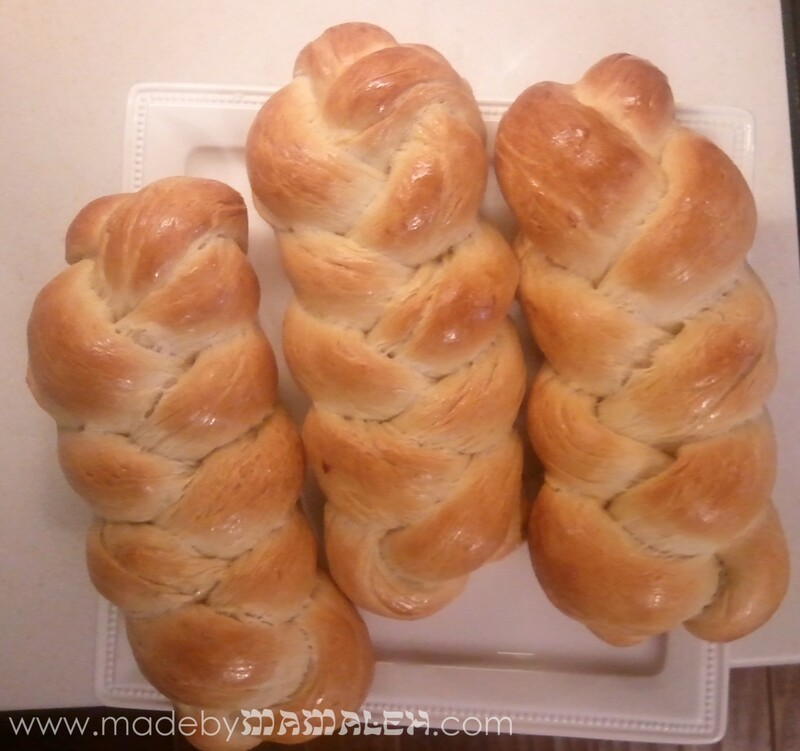 As I mentioned the other week, I love The Challah Blog as it has lots of fun innovative challah ideas and fantastic tutorials for braiding. But, so far my go-to challah recipe has been derived from Tante B’s “Famous Challah.” I’ve made my own addition to the glaze and also simplified her process since I am lazy efficient and like to rely heavily on my trusty Kitchen-Aid. In fact my Kitchen-Aid has gotten such a workout since the beginning of the year that my husband had to replace the grease inside (that has made it work even better and at some point, I’d be happy to share how he did it). This recipe has worked really well every time I’ve made it at home (Seattle). But, I even tried it in the desert (Las Vegas) where I was told bread just doesn’t rise right and it turned out great. It’s not very eggy as far as challah goes but it is quite delicious, especially with the hint of honey on top. So, if the idea of making your own challah scares you, I promise, it’s a lot easier than it looks so give it a try one of these days. Happy baking! 1. In bowl of stand-mixer combine 1 Tablespoon sugar (removed from the ½ cup), 2 cups warm water and yeast.Let sit for roughly 10 minutes until the yeast has dissolved and is foamy. It should go from the top picture to the bottom in about 10 minutes. 2. Once yeast is nice and foamy, add the remaining sugar, salt and 3 ½ cups of flour. Mix using the bread hook. 3. Add egg and oil. Mix. 4. Add remaining 3 ½ cups of flour slowly and mix using bread hook.You may need to scrape the dough off the hook several times and put it back in the bowl. Keep mixing until the dough has formed a nice ball and springs back when pressed with your finger. If for some reason, it’s still too sticky, add a little flour. 5. Spray a bowl with PAM (you can also swirl veggie oil on the sides but I find PAM oh so easy) and put the dough in the bowl. Cover with Saran wrap and a dish towel and put somewhere warm to rise. If it’s cold out you can turn your oven on to 150 and then turn it off and put the bowl in there to rise. The dough will look like the picture on the top. After an hour (or more), it should look like the photo on the bottom. 6. When the dough has risen, give it a good punch down with your fists and then put it back to rise some more. Depending on how rough a week I’ve had, I may give it a second punch down but I haven’t found this critical in making this recipe work. 7. 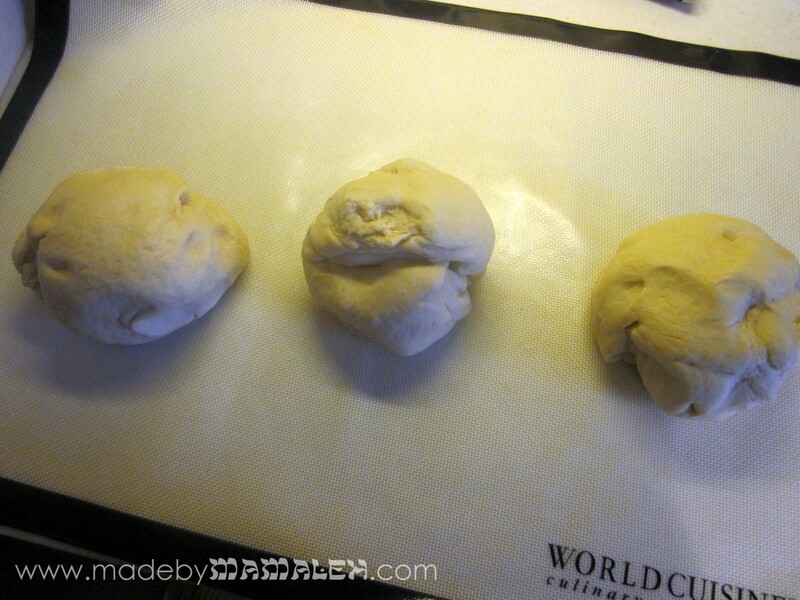 After 2 hours, turn dough onto silicone mat to roll out. 8. 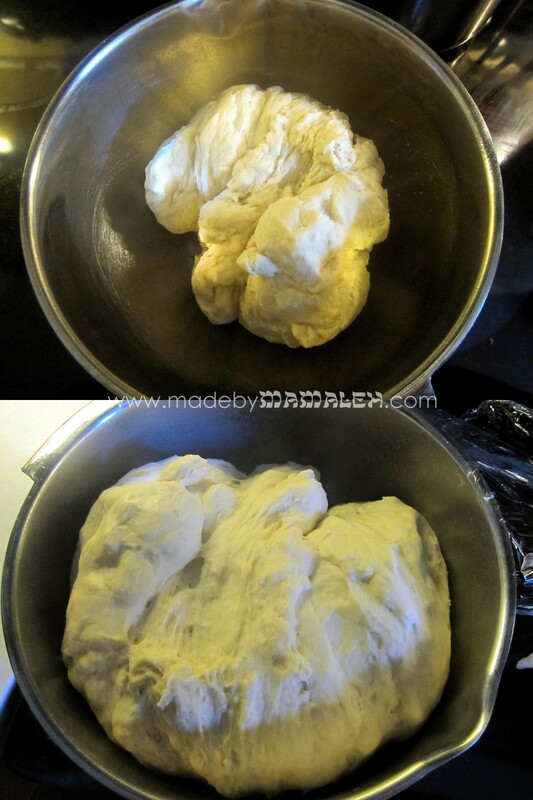 I use my hands to split the dough into two even sized balls – one ball for each loaf. If you want to make three smaller loaves, as I did last week, just split it into three. 9. Then with each of those balls, portion out the dough according to the number of braids you need. Here, I did 3-strand loaves but there are tons of options out there. 11. 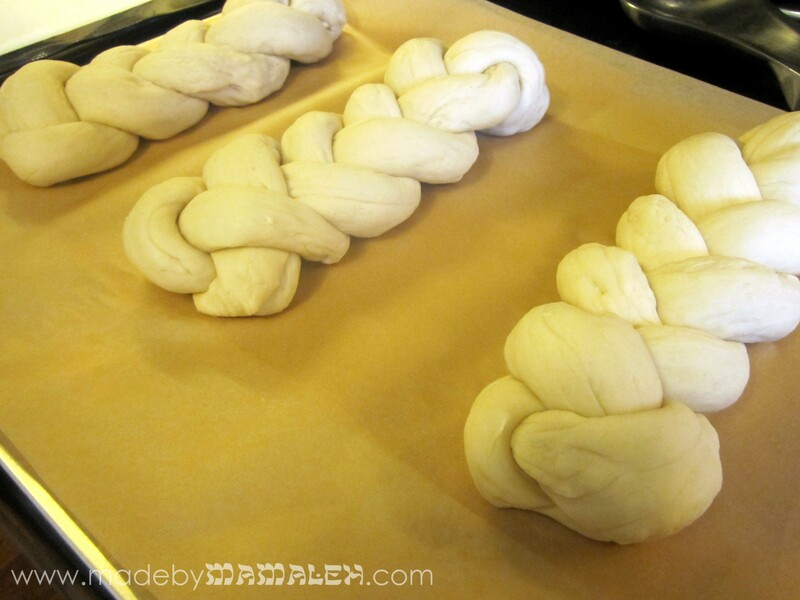 Once the loaves are braided, cover them with a dish towel and let rise for 30 minutes. 12. Preheat oven to 375°F. 13. After allowing loaves to rise, beat remaining egg in bowl. 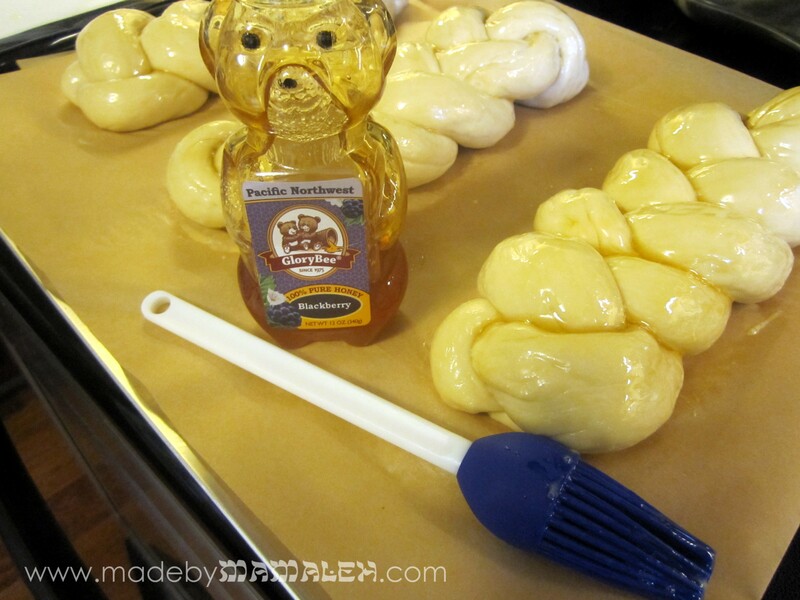 Using silicone pastry brush, lightly brush over each challah. Then drizzle honey on top, to taste and also brush on using same silicone brush. 14. Bake for 25 minutes. Then, turn off oven allow the challah to sit in the oven for another 10 minutes. 15. Remove and allow to cool on rack. Enjoy!